5311 N I-35 Freeway N, Denton, TX, 76207 - Photos, Videos & More! 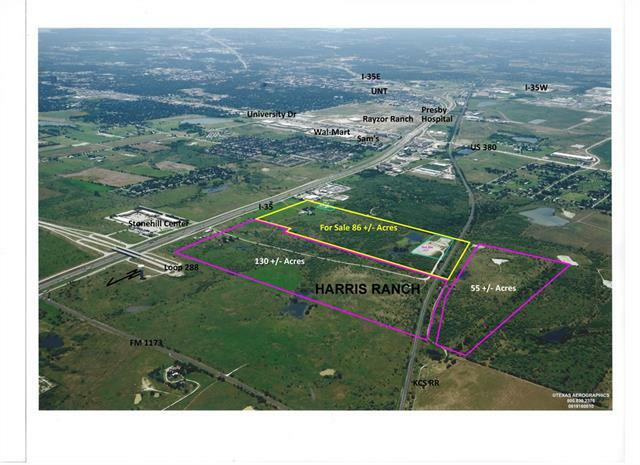 HARRIS RANCH – South Tract For Sale – 86 +- ac net. The property is generally rectangular, running east to west. The eastern portion has excellent visibility from I-35. The remainder is sloping to the west. Utilities: W SS G E, are at the southeast corner. The western portion will require offsite sewer. I-35 is scheduled to be widened to 6 lanes with new flyovers at the Loop 288 intersection. Additional ROW, appx 2.8 ac, will be acquired along the approximate .25 mile frontage. Proposed Zoning by City: Highway Corridor & General Office. Probable use: Highway oriented retail & commercial, high tech office, office warehouse, & low to medium impact manufacturing, etc. Information packet available.